Oracle Monday 4th January 2016 … Moss Vale, N.S.W. Valerie: This last session we had on 4th January 2016 we clarified some of the information about King Tut and his journey to Australia on a Ceremonial Mission to collect the ancient Prince mummy which was in a Tomb at Kariong, nearby Gosford, Australia. Jalarm then commences the session and clarifies from time to time. It is I Jalarm, and I am very pleased to be here. This day and to know that I am welcomed and look forward to working with you. We have a little plan to-day and I know you also have plans so we shall carry on now and I will take my leave for the time being. Thank you My Dear, thank you. Jacqui: Did King Tut have a sickness on the way to Australia? Jacqui: Did Jill Heal him? Jacqui: Did he return safely? The Oracle: YES (but was not strong when asked about healer). Jalarm indicated he wished to speak. Jalarm: It is I, Jalarm, again and I would like to actually put clarity into King Tut and his voyage when he travelled to what we now know as Australia. You understand (at that time) it was (a journey to) Lemuria and Egypt had another name for it – but the young man King Tut was never a robust healthy man. We have already talked about him being slightly incapacitated with his mental abilities – it was not necessarily severe but he had a troubled mind because of what surrounded him at the time in Egypt. Many people were gossiping, bickering and giving him thoughts to think about which he was not able to sort out nor assess in some way – although he knew he should be able to. So he did not talk a lot – he actually just listened and he was a bit confused. On the journey to what was to bring back the body in the Tomb in Kariong – he was not all that well. He had contracted malaria and it repeated itself from time to time and so when he returned he was not all that well – although he hadn’t really had an accident. The accident happened after he returned and that unfortunately was from a chariot in a race he wanted to involve himself in as a young man. He liked adventure and he always wanted to keep up an appearance that he was a good as the next man. Unfortunately the accident rendered him incapacitated again – quite seriously for a while – but he did start to recover. However, because of the malaria he was not able to gain full strength to recover and he died. There were also some rumours that he had been poisoned and in some ways that was true also. In other words he was ‘helped’ to actually die. This was not meant to happen of course, but there were many priests around that wanted him out of the way. I would be a little careful about how you express this, but this is how it happened at the time. I will leave you now my dears so that you can ask more questions of the Oracle. Jalarm:It is me again, and I would like to clarify about Nefertiti – her bust or image was found in the desert and it is held in the Museum. As for her body when she died – it is in a tomb, but not one that would be expected. And so, I would like you not to worry about that – because we are giving you clues – and if we talk about Nefertiti it could take people on the wrong path. When I say ‘wrong’ I mean a path that will take it away from what we are focusing on which is the Egyptian tomb that exists at Kariong. So could you leave off the idea of asking more questions around Nefertiti? I just wanted to explain that. Jalarm: It is I, and Yes indeed, you Jacqui were involved at the time of the Amarna Period and the lives of the Royals that we have spoken about – and in a way you were connected to Jill also even though she was from a different country (Phoenicia) but you my dear were connected to Egypt. Now you have been given insight to the relationship you had and if you think about it, (I am saying this) we are helping you to remember. So I would like you to go into your mind, and think about when you were in the period and feel this and think about the thoughts that came to you at the time because this is how we work. This is how we give entry into a past life. I would like you to remember and think about how you felt and any other things that may have come to you at that time. This is useful for you to start trusting your own ability to connect readily to your soul consciousness. Is that alright? Jacqui: I am feeling that I am standing in that pyramid again. Well, I can remember that Napoleon had stood there and looked across the desert. I remember looking across the desert a recalling a life as a scribe and I strongly related to that time – that life as a Scribe – as a man. And that is all I can remember. 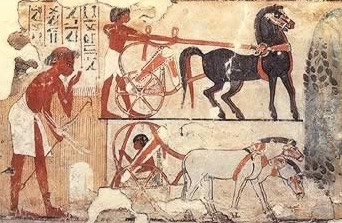 enlargement of scribes from a wall depicting everyday work during the Amarna period. Question to Oracle: Is this the time of King Tut? Jacqui: Somewhere there is a connection to Abraham? Question to Oracle: Is this connection to Abraham in King Tut’s time? On the voyage to Australia. The Oracle: SAID she needed to trust the information coming through. Jacqui: Maybe that is why I have always been frustrated with the Kariong Tomb History. The Oracle: YES (very strongly). The Oracle: spelt out name of scribe was LEI … … and there were 6 boats on the Mission to retrieve the mummy of the ancient Prince. Jalarm: You now have all the necessary information now that we want to give regarding the Tomb at Kariong and the interaction between Egypt, Indonesia and the travels through the oceans to Kariong – you have it all – and er, there is more but we would like to leave it at this time. This enough for the moment. Is that alright? Jalarm: That is good, that is good. Jalarm has given an important set of principles about entry into past lives – how this takes place – and connection to the soul consciousness. The two are connected in metaphysical ways, for feeling and emotion connected to soul images, words, sounds, memories, and perhaps, for those who are clairvoyant, pictures from the past. It is not all pictures from the past, for there is clair-gnosis, knowledge that arises within from the memories of the soul. Certainty, a sure knowing along with recalled names, times, people arise. Heat and cold, feeling and smell, tactile memories return and the body may exhibit such memory. Jacqui gives one such example of this from the session with The Oracle, above. Mind, the energies are very high, and there are observers from other worlds present and learning about the soul story, its winding narratives through a thread of time that both speeds up, slows down, and moves in and out of other dimensions. This is the (sometimes) confusing experience of those who explore the soul story. The soul itself is androgynous – it is neither male nor female, and takes on different genders in different lives; so the soul can speak of male or female experiences. The Hierarchy have spoken with us on this issue – that the soul memory of being one gender can have a very strong magnetism to that gender in another life, and hence, the soul consciousness may have strong attraction to a particular gender in this life regardless of being born male or female this time. Strong energy is also needed to ensure that people return to the present and emerge from their soul story into the present-day mind, body and awareness. This is why people are asked, ‘What is your name? What day is it? What year is it? Where are you?’ along will all manner of apparently silly questions designed to ascertain that the person has actually returned from the past. For some, such explorations should not be done alone but with the aid of gifted, experienced light-workers. With this understanding, we now come to Valerie’s reflections on the November – January Mystery School meetings. We have the recovery session and new information – to which the ladies of the Mystery School were led as per the plan of Jalarm – as Valerie begins to offer a synthesis and draws on her vast experience as a light-worker. As Valerie draws threads together she also draws on other experiences around her Kariong research, and from people who have come to her for assistance in being connected to their soul history. After Tutankhamun’s tomb was discovered, it was given the name KV 62, following a system of naming in the Valley of the Kings. It is a relatively small four-chambered tomb … recently, a hidden tomb was discovered in this tomb complex. Another coincidence has been a male who regressed into remembering holding the energy of King Tut in his Soul History. He felt it hard to think properly as if he (as King Tut) had a slight mental disability. He had a club foot. He also felt he had made the same journey a long time before, but had been bitten and died from a reptile poison. 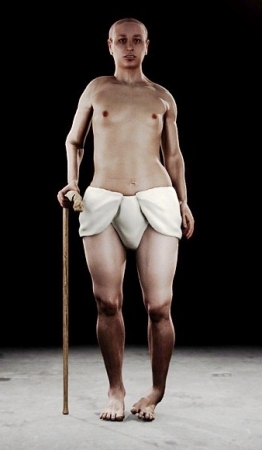 (It would seem that King Tut and the earlier Prince were from the same soul.) 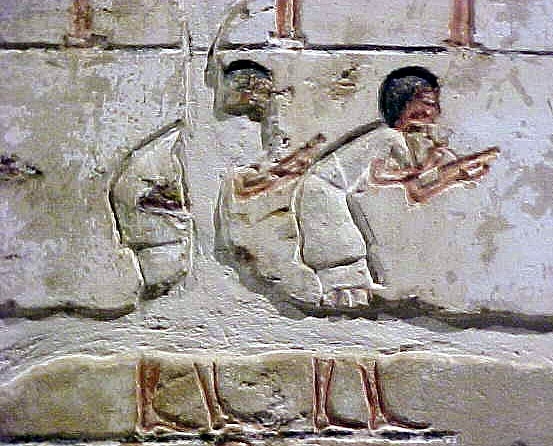 He had also seen himself setting off with an armada of ships from Egypt in both lives. King Tut had fallen sick but was healed on the journey. In the first life, he had died. 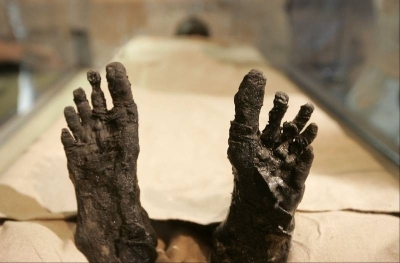 Photograph of the feet of King Tut’s mummifed body, showing deformity of the left foot. 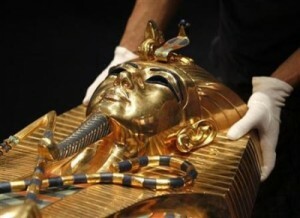 French team reconstructs King Tut’s body from xrays of the original mummy. It shows an older man, who had a club foot. The main thing to remember is when I was prompted to write my article KARIONG RESEARCH – Phoenicians and Egyptians in Australia – it was published on my website before I heard about the possible chamber being found annexed to the existing King Tutankhamun’s Tomb in the King’s Valley. This was announced in November, 2015 – well after I had completed my research article. This would also explain why there are old hieroglyphs written in the tomb at Kariong as well as more modern hieroglyphs and why there are no mummies there. 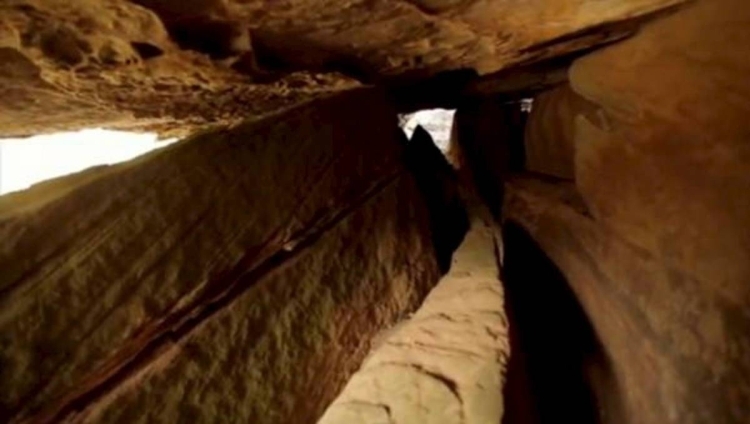 The entry way to the tomb – huge stone oblongs and blocks – has collapsed from erosion over time. It is difficult to explore. It would also suggest that no one is in error – all are right in their scientific research. Just different pieces of a puzzle. above-ground chamber found at Kariong; the clear lines in the oblong blocks show different technology was used to shape and lay the stones.